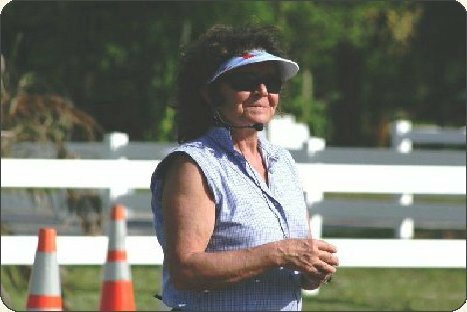 Judy L. Cross Strehlke has been teaching riding for over thirty years. Her early training was in Western and trail riding. 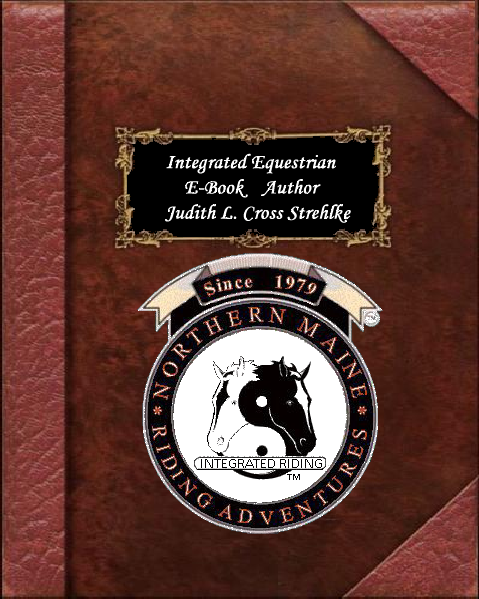 As a Maine native from Dover-Foxcroft,Maine USA Judy was introduced to Dressage and Combined Training thru Pony Club as a teenager. During college in Equine Science, she started competing in Combined Training Events. As a young professional rider and IV instructor, she was coached by members of the US Olympic Three Day Team. She continued to compete herself and coach young riders for over 25 years. In 1979 after riding and teaching professionally, Judy returned to Maine for surgery to correct congenital bone defects in her feet. 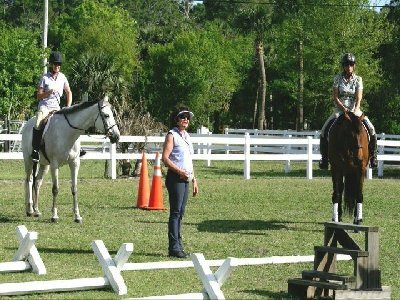 As she was returning to riding, she had the opportunity to take a clinic with well known author and instructor Sally Swift. 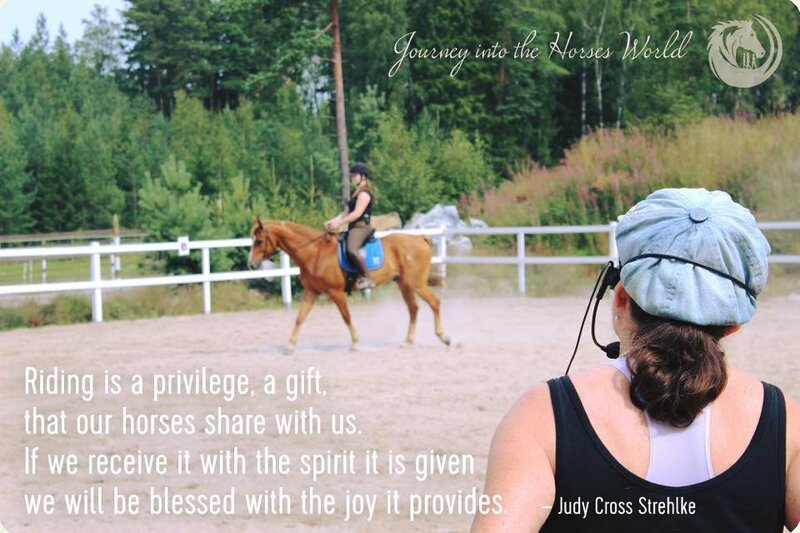 This was a life changing experience for Judy and she began to pursue the Centered Riding path by studying extensively with Sally, continuing for over 20 years. 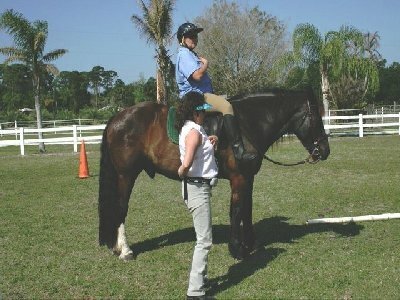 She became an Advanced Level IV Centered Riding Clinician in 1999, one of only 17 in the US and Europe. 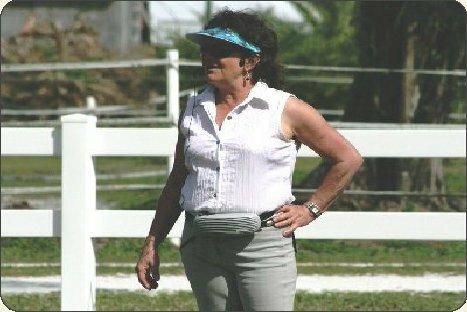 Judy's own struggle with chronic back pain and incorrect habitual posture gives her a unique perspective in helping others over come physical challenges that prevent them from achieving their riding goals. This path led her to Therapeutic Riding. 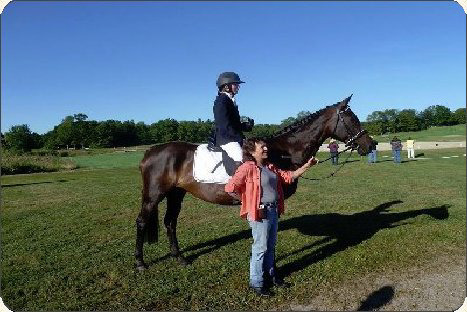 In 1980 she started one of the first Therapeutic Riding Programs in Maine after attending the Cheff Center. She became a PATH International member in 1984. She was the co-chair for PATH for the State of Maine. 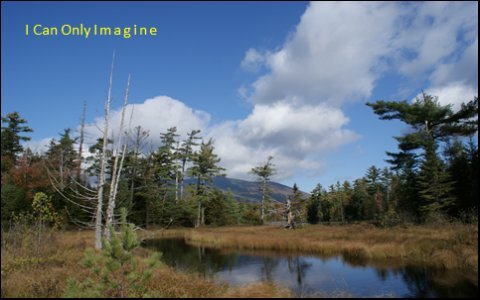 She is an EFMHA member and offers Adventure Based Learning programs out of her facility in Dover-Foxcroft, Maine. She and her husband Bob Flury-Strehlke have a 70-acre horse farm in Dover-Foxcroft, Maine USA. Judy taught children with learning disabilities and mental health challenges as well as Dressage and Eventing. She and her husband Bob Flury-Strehlke have a 70-acre horse farm where Judy taught children with learning disabilities and mental health challenges as well as Dressage and Eventing. Judy's special interest is on children on the autism spectrum At Risk Youth especially those that are incarcerated and Veterans returning from the military. While focusing on bio mechanics of riding and habitual holding patterns in the body. 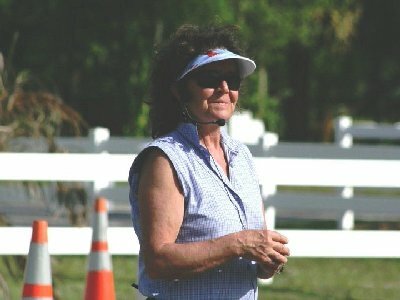 Judy studied Ti Chi, Alexander Techniques, Neuro pathway work through Feldenkris and TEAM, Centered Riding®, Brain Gym and Balance in Motion. 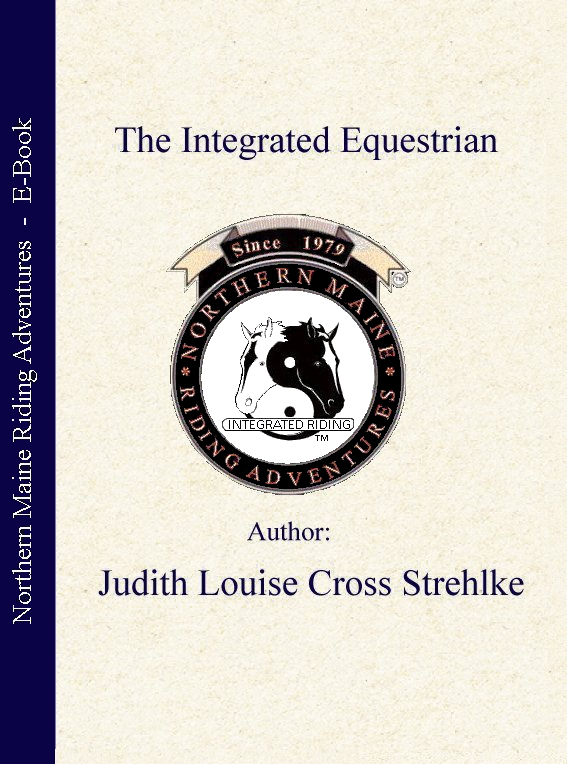 Judy developed her own way to combine these theories on movement called Integrated Riding. 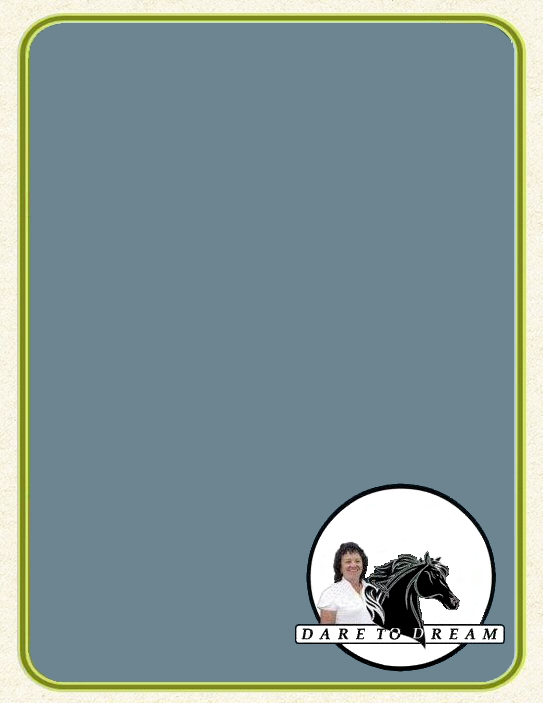 Her approach focuses on how to enhance learning in all riders using Movement Based Learning principals. She incorporates Brain Gym and Centered body work in all her lessons and uses a series of exercises both on the ground and on the horse to develop kinesthetic learning skills. 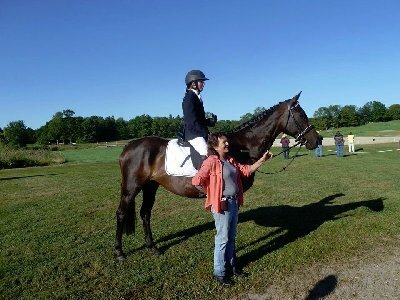 She is an advanced PATH instructor and an Advanced Level IV Centered Riding International Clinician. 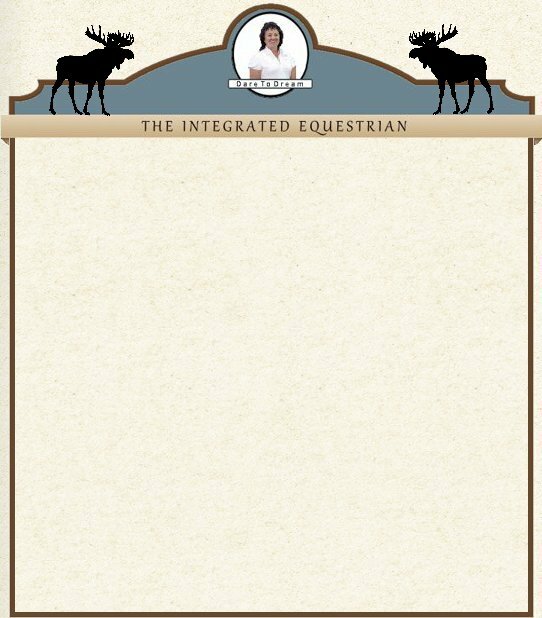 She currently teaches Centered Riding to instructors throughout the US and Europe and Integrated Riding Techniques to physio- therapists all over Europe and The US. Judy is one of three instructors in an international collaboration called "Journey into the Horse's World". 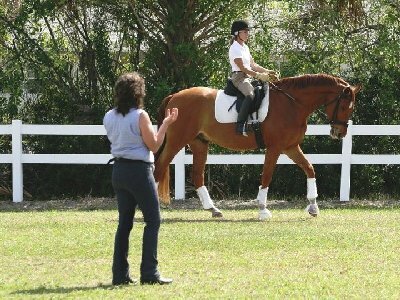 This three year educational program combines non-threatening groundwork, with Centered Riding and Classical Dressage training. The Journey is currently being taught in Finland. 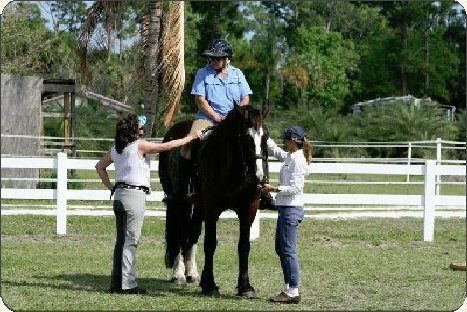 This course is for riders who are looking for a softer and kind and positive way to train and ride their horses based on Partnership, communication, and relationship building. 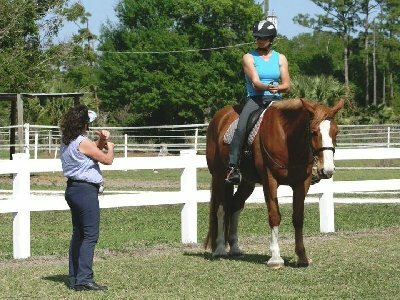 Judy teaches the riding section which emphasizes relaxation, body language in the saddle and how to develop the language of the aids without tension. 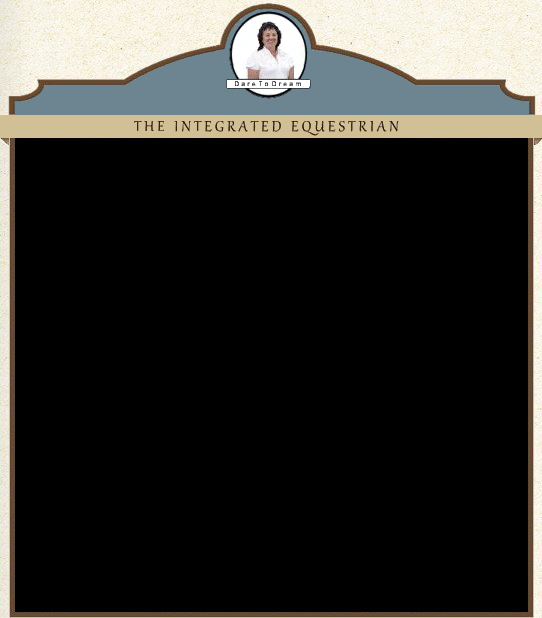 She incorporates Brain Gym and Centered Riding body work in all her lessons and uses a series of exercises both on the ground and on the horse to develop kinesthetic learning skills. Integrated Riding Techniques to physio- therapists all over Europe and The US. 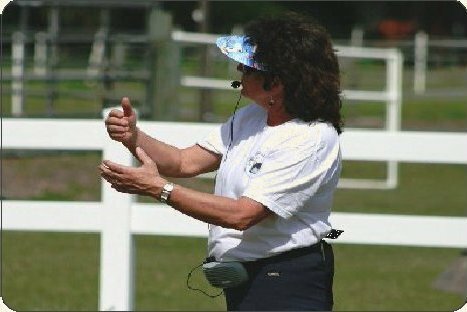 Judy is one of three instructors in an international collaboration called, Journey into the Horse's World. 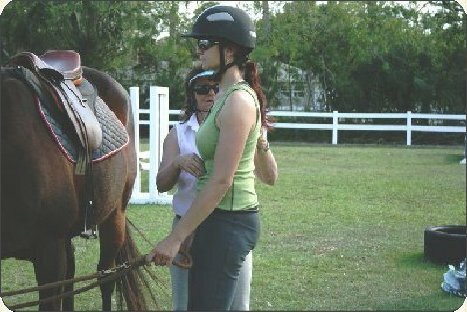 This course is for riders who are looking for a softer, kind and positive way to train and ride their horses based on Partnership, communication, and relationship building. 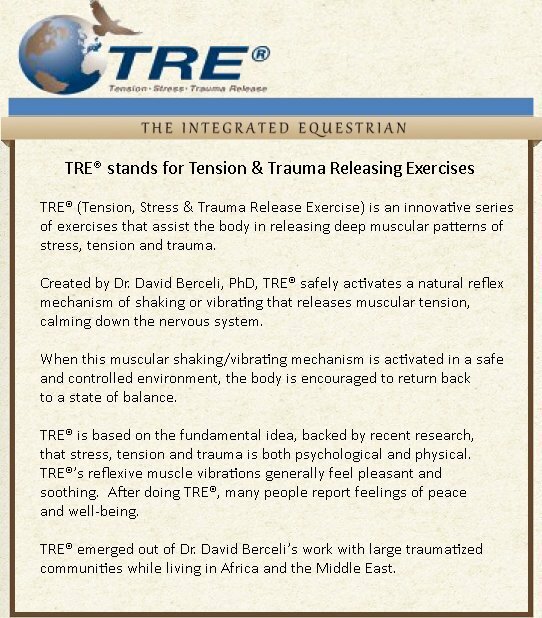 "TRE® stands for Tension & Trauma Releasing Exercises"
The "Basics" of Centered Riding are fundamental concepts and personal tools for every rider. 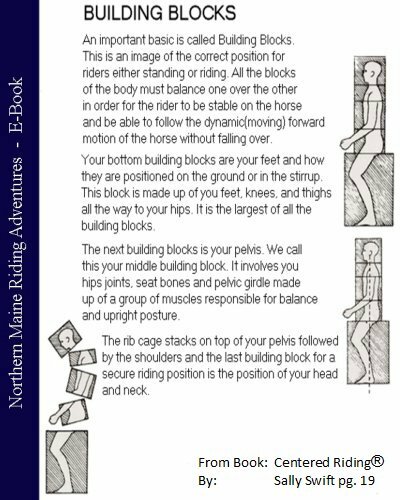 When we are able to apply these basics in our riding and use of self, they help us use our mind and body well and improve our balance, security, freedom, "feel" and communication with our horse. Each of the basics interacts with all the others; if you improve one basic, the others are all affected. One of the first things taught in Centered Riding is the concept and practical application of "the Basics." We each discover our own personal experience of how we feel when each basic is working well for us. Riders should continue to explore deeper understanding and further discovery of each of the basics and new ways to apply them, as long as they are riding and learning. Soft Eyes: Use of eyes that are relaxed and open, with wide-angle vision rather than narrowly focused on one spot. 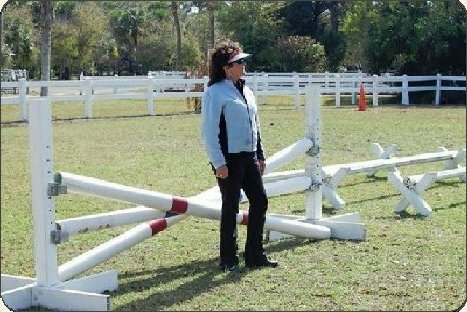 Soft eyes allows you to see more and be aware of more around you because you use your peripheral vision, and also opens up your other senses awareness to increase your ability to feel your horse. Hard eyes give the effect of trying too hard; they cause stiffness and inhibit "feel" and free movement. While a horse cannot see his rider's hard or soft eyes, he can feel the resulting stiffness or lack of it in the rider's body and reacts accordingly. Over-concentrating on the horse in a negative way (forcing and "fixing") or obsessing about some aspect of the rider's body can cause a similar effect, sometimes called "hard eyes inward." Breathing: Deep, full and natural breathing, using the diaphragm rather than breathing high and tight in the chest. Good breathing affects the whole body and the horse as well, helping centering, relaxation and "feel" and releasing excess tension. Breathing can also enhance energy, rhythm, freedom and comfort, and also improves communication with the horse. Centering: Becoming aware of your center of balance, movement and control, which is located in the lower body below and behind the navel. Centering can be described as internal balance, both in the body and in the mind. Balance: Finding the balance of the body and all its parts. Balance is sometimes described as "building blocks," referring to "stacking up" the parts of the body vertically, so it is balanced with the feet underneath the center. When a rider rides in a forward balance or jumping seat, the angles of the body are balanced. 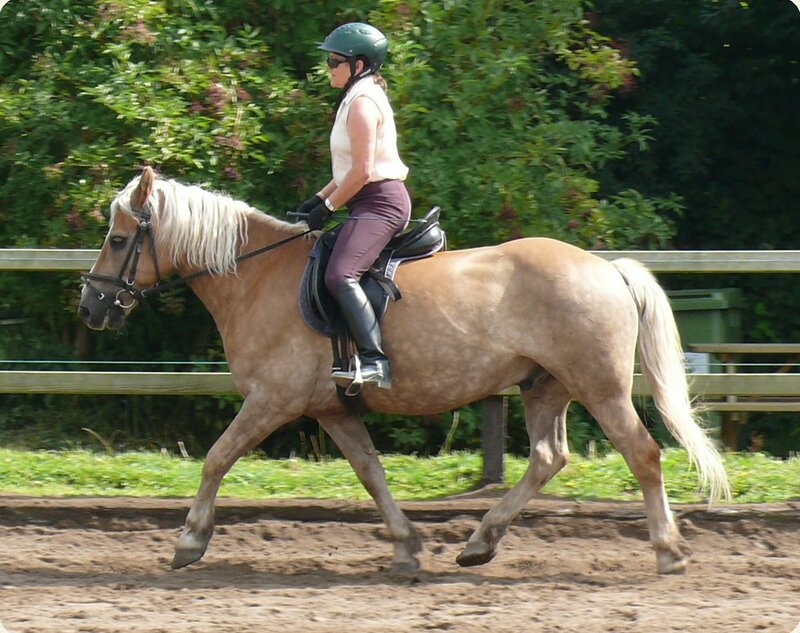 Only when the rider's body is in balance can the joints be free to allow the body to absorb and follow the horse's motion; if the rider's body is out of balance, it will have to stiffen as it resists the effect of gravity. Grounding: Experiencing your connection to the earth and gravity, which gives you balance, security and the ability to engage your joints as springs. The two major points in the body where we experience grounding are the seat bones (when seated) and the feet, especially at the natural balance point of the foot sometimes called the "bubbling spring". Clear Intent: Making a clear mental decision organizes the body and mind and enables you to communicate clearly with your horse, your body and with others. 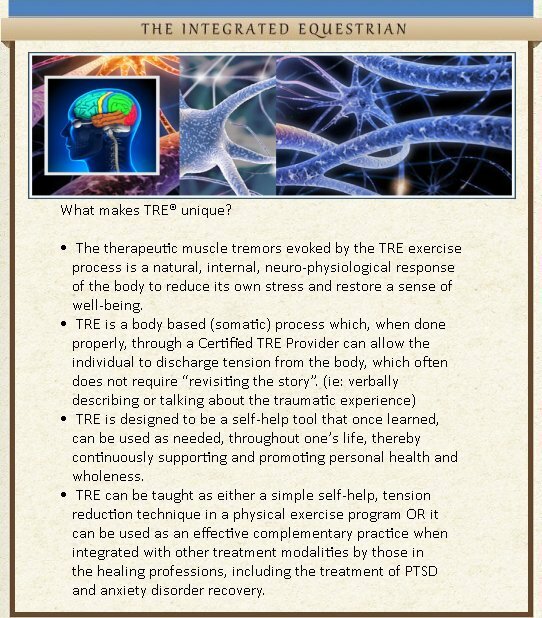 It uses "ideokinesis" (a word meaning "the idea you hold in your mind affects the way your body moves"), to give direction to the body and to the horse without having to consciously apply muscular effort. 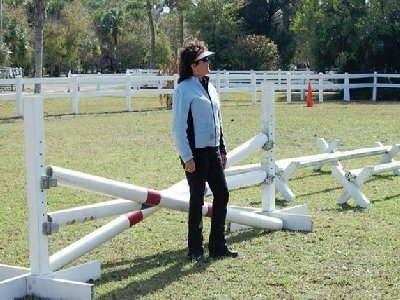 Clear intent is essential for control and clarity in riding and handling horses. The easiest way to begin to use clear intent is to ride your horse in a specific direction. WITHOUT THE HORSE WHAT WOULD HAVE BECOME OF MAN? Today, PATH Intl. has more than 850 member centers and nearly 7,600 individual members in countries all over the world. PATH helps and supports more than 54,000 men, women and children with special needs each year through a variety of equine-assisted activities and therapies programs. Though PATH Intl. began with a focus on horseback riding as a form of physical and mental therapy. 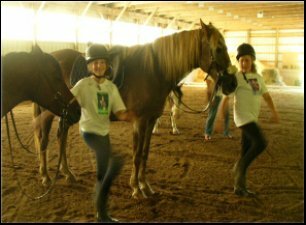 The organization and its dedicated members have since developed a multitude of different equine-related activities for therapeutic purposes, collectively known as equine-assisted activities and therapies (or EAAT). PATH Intl. 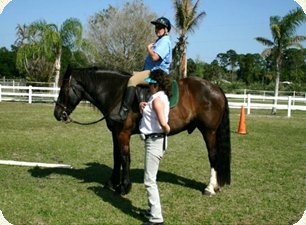 Certified Instructors use these equine-assisted activities and therapies to help tens of thousands of individuals each year with physical, mental and behavioral challenges gain strength and independence through the power of the horse. EAAT helps people from all backgrounds and all walks of life in a variety of ways. Increasing strength and flexibility, improving motor skills, promoting speech and cognitive reasoning, and building relationships and social skills. 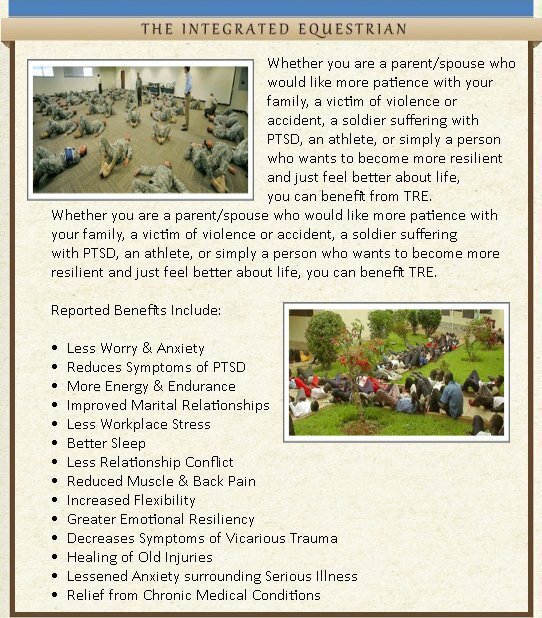 The individuals served by PATH Intl. members may face any number of challenges, including paralysis, multiple sclerosis, autism, Down syndrome, substance abuse, traumatic brain injury or amputation - but all benefit from the power of the horse. PATH Intl. upholds its mission to promote excellence in EAAT through four primary program areas: instructor certification, center accreditation, educational opportunities and advocacy work. PATH Intl. certifies instructors and accredits centers according to a set of field-tested standards designed to ensure the highest levels of safety, ethics and effectiveness in the industry. Instructors must attend workshops and pass both a written and practical exam to become certified to teach EAAT programs, and centers may undergo a voluntary site visit to become accredited service providers. 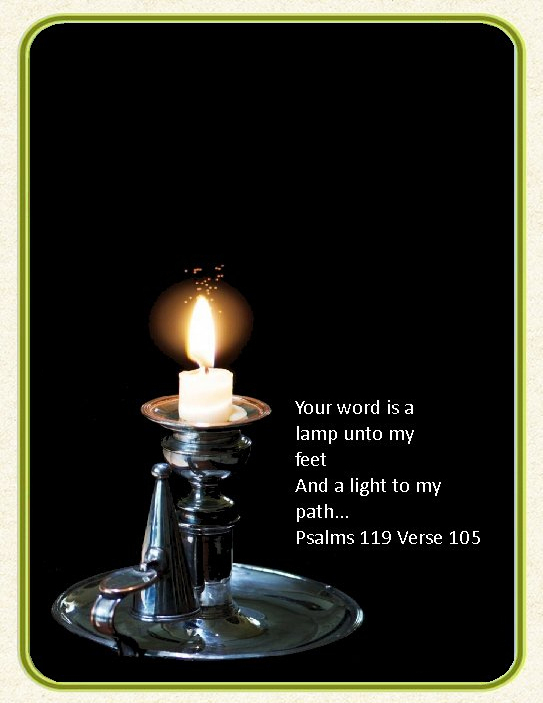 The process is led by trained PATH Intl. members who volunteer their time and expertise to help teach, test and grade fellow professionals seeking certification or accreditation. To date PATH Intl. has over 3,500 certified instructors in several disciplines and almost 800 member centers who confidently provide EAAT services according to PATH Intl. standards. In addition to certification and accreditation, PATH Intl. offers many different educational resources to its members and other industry professionals. Including hands-on workshops, educational publications and industry newsletters, mentor programs and peer networking, and regional and national conferences. PATH Intl. 's conferences attract hundreds of attendees each year, who come to hear lectures by leading industry professionals, learn about the most recent developments in EAAT, and participate in discussions about trends in the medical and equine fields. In addition to these educational opportunities, PATH Intl. also advocates for the application of professional standards in all realms of EAAT and partners with like-minded organizations to promote the use of EAAT in new and innovative ways. Access and inclusion - promoting diversity and opportunity in equine-assisted activities and therapies. 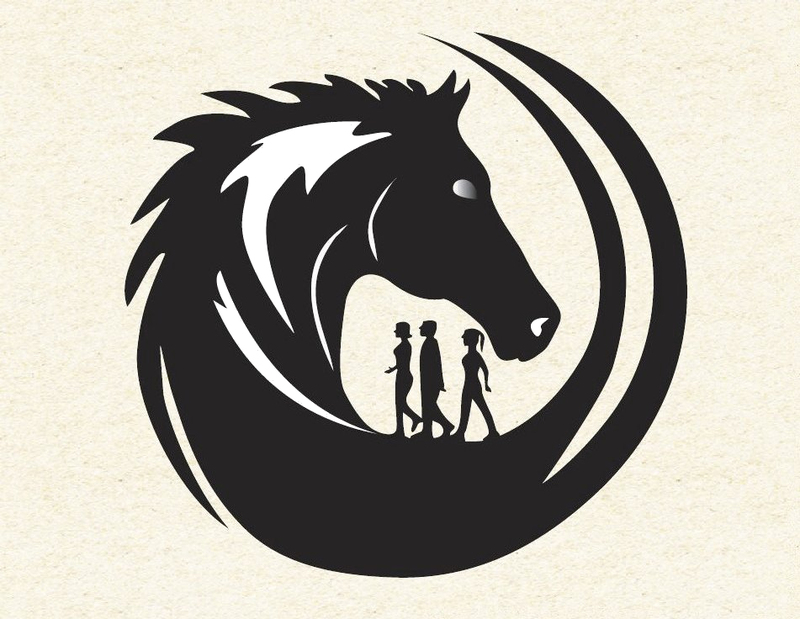 Compassion and caring - providing a culture of safety, understanding and ethical treatment of humans and horses engaged in equine-assisted activities and therapies. Cooperation and collaboration - connecting and partnering with those who share the PATH Intl. vision in a mutually beneficial manner. Education - sharing valued knowledge with our constituents to facilitate their success. Excellence - promoting quality in all undertakings. Innovation - encouraging and supporting creativity, inquiry and cutting-edge research. Integrity and accountability - ensuring that all business is based on ethical principles and conducted with transparency. Professionalism - enhancing the value and credibility of the industry. Service - providing effective and responsive information and programs to our constituents. Holism - promoting an awareness of body, mind and spirit in equine-assisted activities and therapies. PATH Intl. 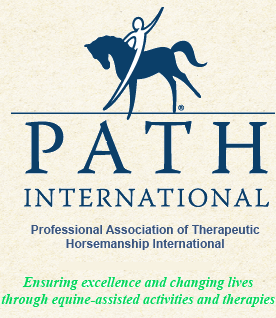 History: Professional Association of Therapeutic Horsemanship International (PATH Intl. 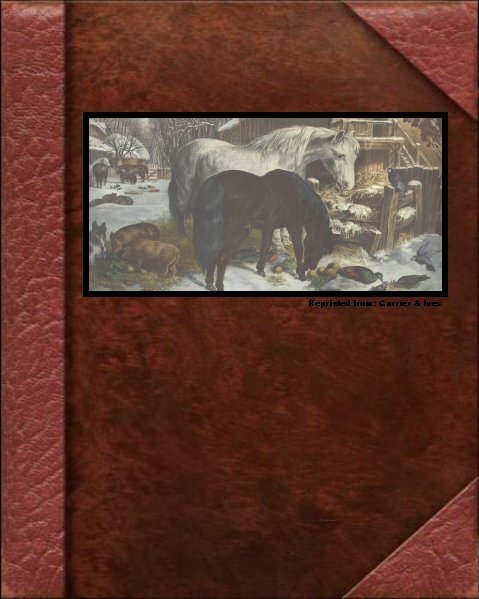 ), along with its dedicated members and volunteers, has been a pioneer in the field of EAAT, bringing the novel idea of therapeutic horseback riding to the United States from Europe in the middle of the twentieth century. 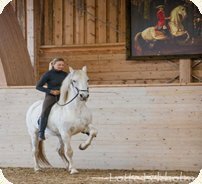 Lis Hartel, an award-winning dressage rider from Denmark, is generally regarded as the impetus for the development of therapeutic riding in Europe. 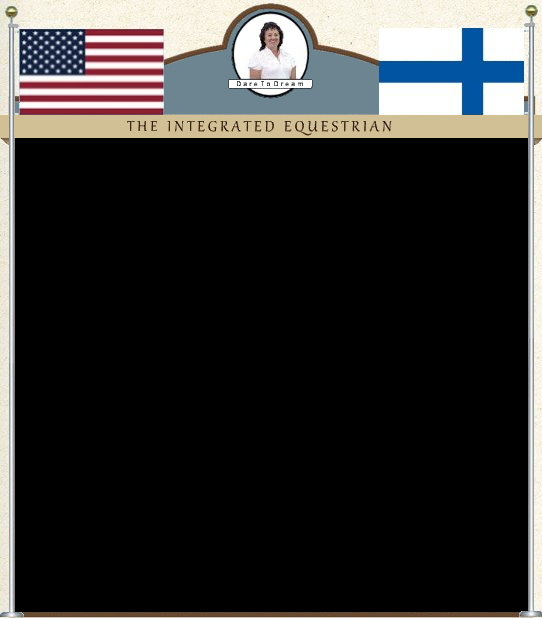 Grand Prix dressage at the 1952 Olympics in Helsinki, and medical and equine professionals around Europe soon began to implement programs for riding as a form of physical therapy. Word of these events spread quickly to the United States and Canada, and therapeutic riding centers began opening in North America as well. Two of the first professional riding centers were the Community Association of Riding for the Disabled, founded by J.J. Bauer and Dr. R.E. Renaud in Toronto, Ontario; and the Cheff Center for the Handicapped, founded with the help of Lida McCowan in Augusta, Michigan. A group of 23 forward-thinking and passionate individuals soon recognized the need for an organization to act as a clearinghouse of information about therapeutic riding. On November 2, 1969, this group gathered at the Red Fox Inn in Middleberg, Virginia, to lay the groundwork for the North American Riding for the Handicapped Association (NARHA). 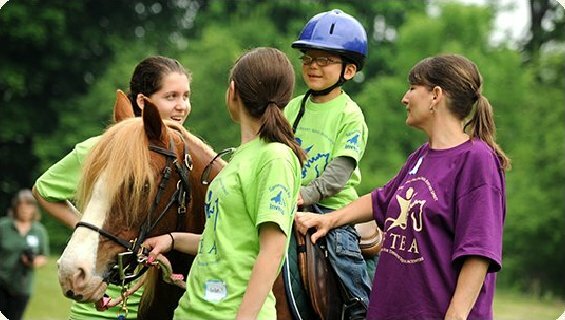 From these beginnings, PATH Intl., as it is now known, has grown to thousands of members across the world and expanded upon therapeutic riding to include dozens of different equine-assisted activities that benefit people with special needs. Today PATH Intl. headquarters are located in Denver, Colorado, but hundreds of volunteers from all over the country - including a few of the founding members - still help run, govern and grow the organization so it may continue to be an industry leader. 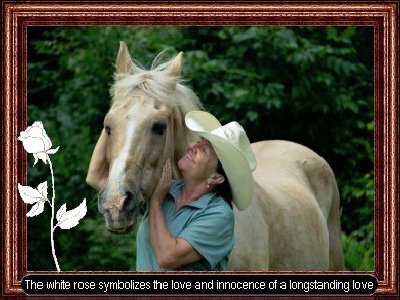 "Journey Into The Horses World"
Understanding Body Language Of the Horse Through "A Journey into the Horse's World" What is Journey into the Horse's World ? 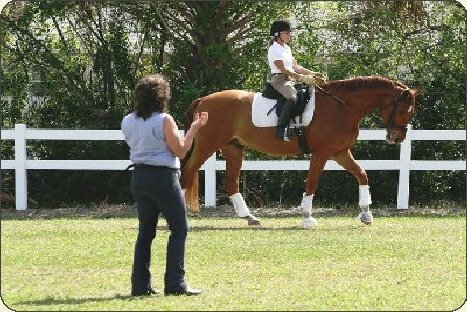 This a three-year educational Journey that combines Groundwork Communication, Centered Riding®, and Classical Dressage training. 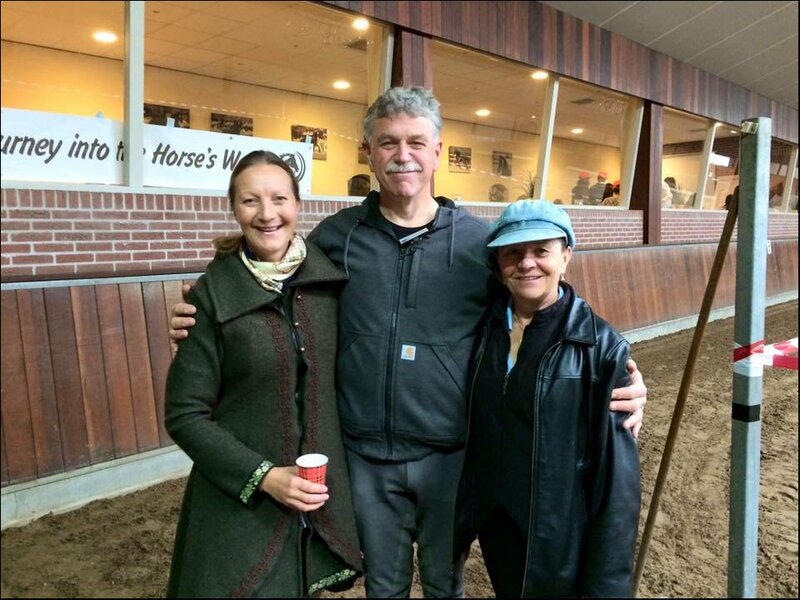 It is a collaboration of three international instructors who have more than 80 years' combined experience between them in the World of the Horse and rider. beautiful and it has the capability of giving us escape from our mundane existence." The entire course is taught over three years time. Each clinician meets with the participants 6 times for four days each. Many of these meetings have all three clinicians teaching together. This part is about creating a flow in which you and your horse can go. The way to do this is through body language which is directed by your state of mind. Piet guides people to a deeper understanding of their own state of mind. 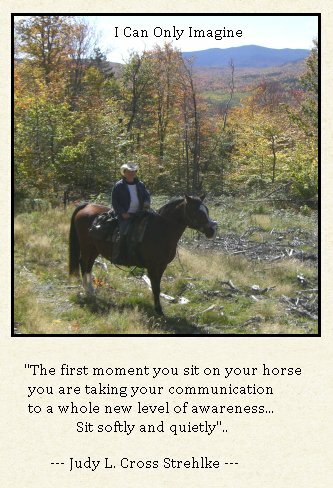 Then and only then can communication with horses come from a clear and authentic place within us, only then can the horse experience the true you. 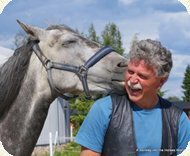 Piet will be offering you the opportunity of how to influence your own state of mind to open up better communication between you and your horse. 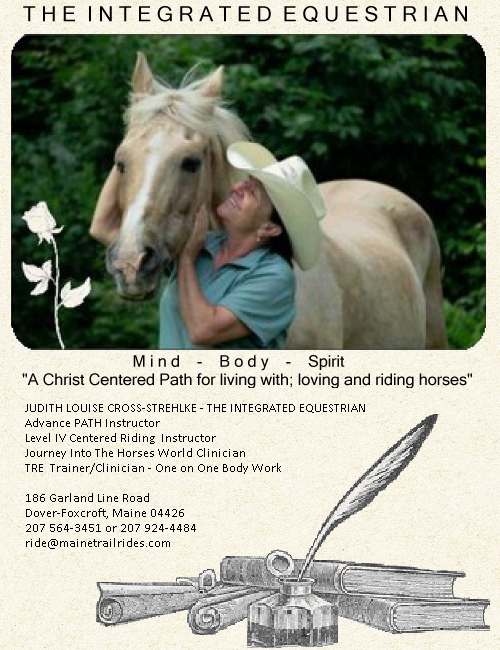 Centered Riding® taught by Judy Cross Strehlke, Level IV Centered Riding Clinician. This part is about the flow of energy in the rider's body and the impact on the natural balance and movement of the horses. 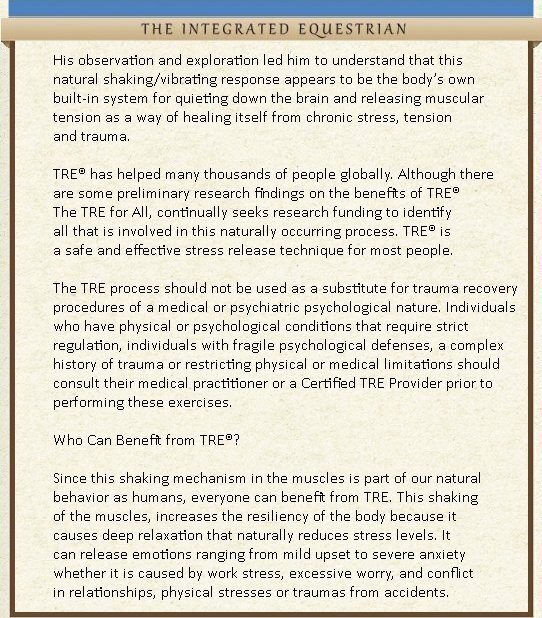 You will learn how your state of mind affects your body's movement and energy flow as well as exercises to increase relaxation, softness, and connection while riding. Habitual movement and posture of the rider often interferes with horse's ability to perform the tasks we ask in a balanced and healthy way. 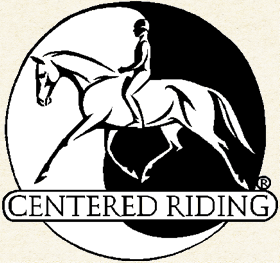 Centered Riding® offers a way to change those habits and become better riders. 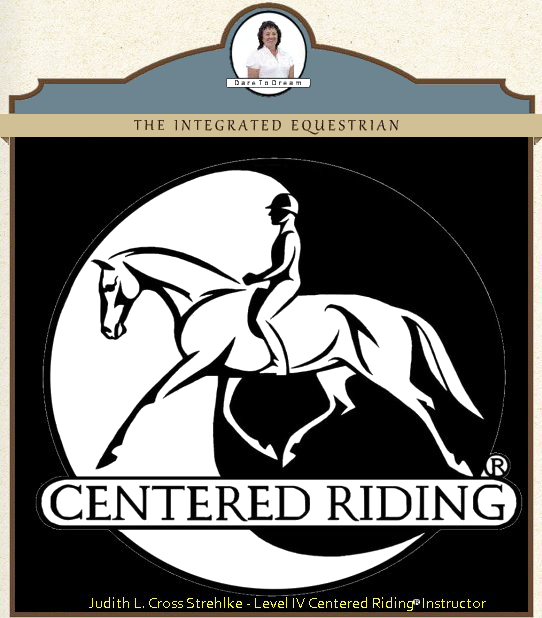 After completion of the Centered Riding® portion of the Journey, participants will be qualified as Level I Centered Riding® Instructors an international certification. 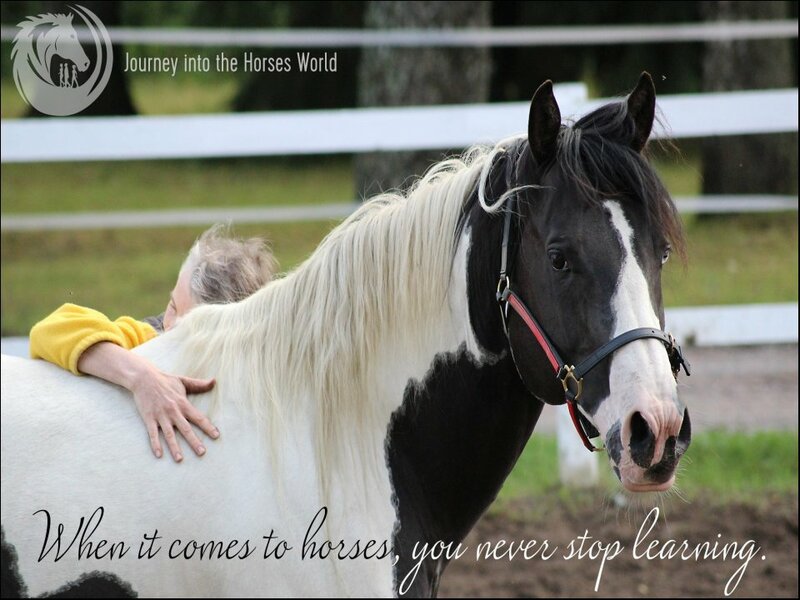 Hanna Engstrom has been a lifelong rider and has her own teaching facility in Gotland, Sweden. She is a recognized trainer in this method. She has been trained in Classical dressage with the masters from the Academic Art of Riding. She uses patience and respect for the horse to help them discover their own balance. Her unique ability to understand the movement of the horse based on understanding balance adds the missing link in our Journey to help horses reach their own physical and mental potential. This enables them to perform the tasks we ask of them without creating physical problems. Learning to listen to the horse's balance language through their movement allows your horse to carry you in a way that is best for the horse. Organizers may add an additional charge for use of a horse if participants cannot bring their own. There could also be a stable fee for those working with their own horses. There may also be an additional charge if the organizer provides lunches and coffee and snacks during the breaks. These would be added to the total costs per participant. We prefer that lunch be provided in order to keep the group together. Participants can also bring their own or order delivery. However, it is better if everyone eats in the same place so we can continue our discussions through lunch, when people leave for lunch it breaks up the flow of the course. Judy Cross Strehlke is gluten free. Hanna Engstrom is a vegetarian. Piet does not eat pork. Note: We will also provide our own lunches if not supplied by the organizer. It is important that the three of us are able to stay together during the clinic. We are willing to stay in a private home if available and/or we would be willing to rent a place for the time we are there at our own expense. We will also rent a car for our own transportation as well as feed ourselves for supper and breakfast everyday during the clinic. The organizer would be responsible for finding appropriate lodging for us at a reasonable cost. 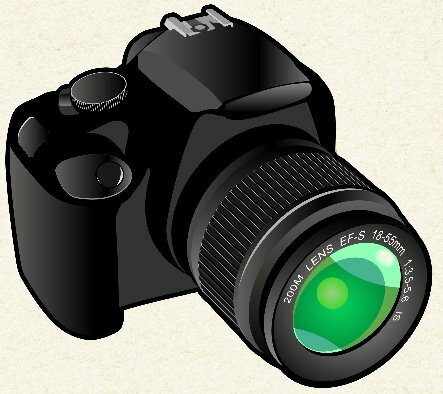 Travel Costs: Judy, Piet and Sarah Jane will be responsible for their own travel costs. This includes transportation to America and also to and from our accommodations. 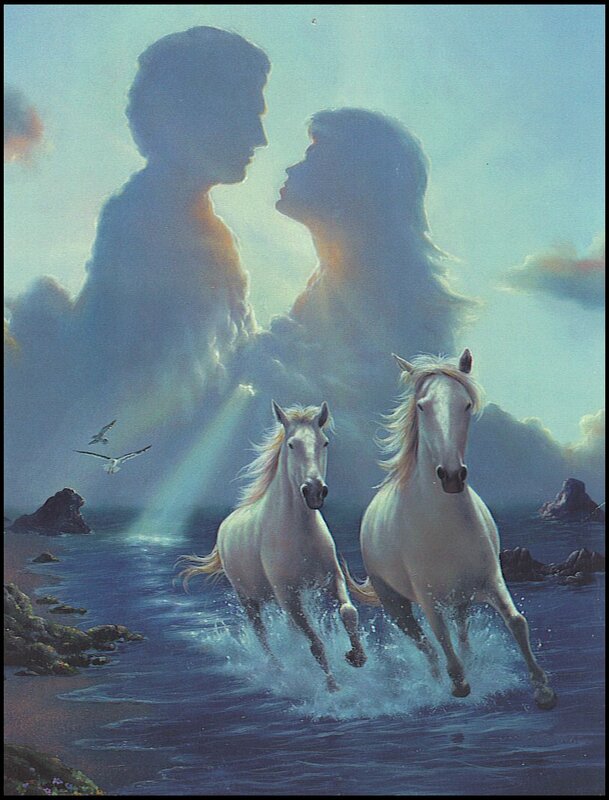 Together we have planned a Journey into the Horse's World. When you enter their world, together you can travel wherever your destination leads you. The first moment we approach the horse with the halter the communications begins. Are we listening to the horse who is communicating with his movements and body language? Are we even aware of what our movements are saying to the Horse? Are you aware of your own state of mind? 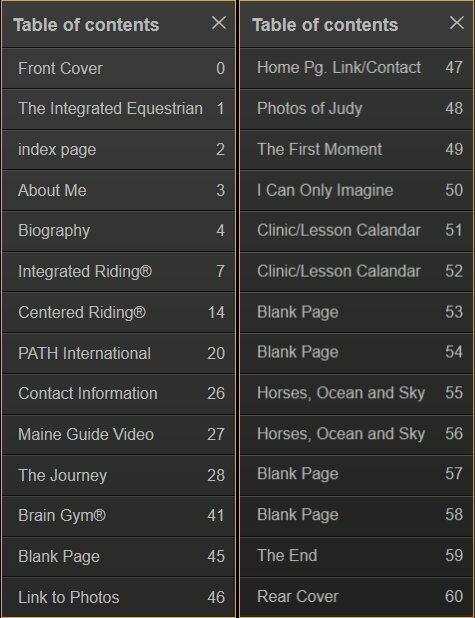 How does your state of mind impact your horse? 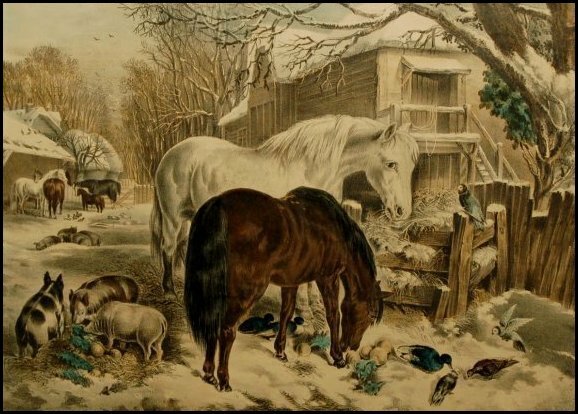 Are you communicating in the Horses own language? 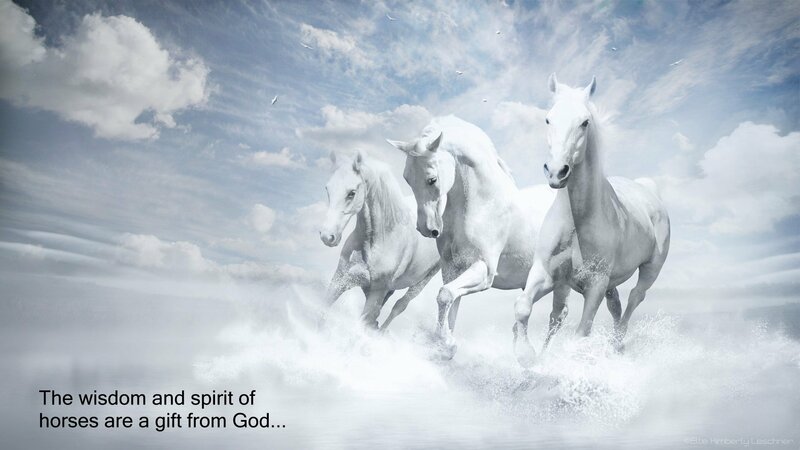 Do we know what the horse is saying to us? Do you know how your energy impacts the horse? Piet Nibblelinks unique way of Body Movement Communication with horses begin the awareness process in this Journey. You will learn the horses language on the ground. The first moment we sit in the saddle the communication continues and the second phase of the Journey begins. 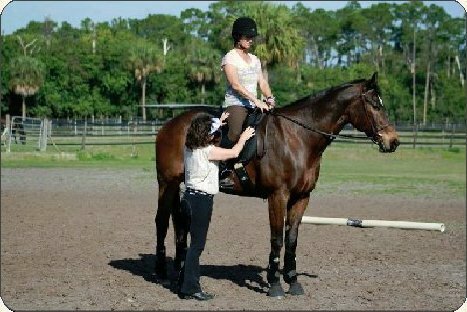 How riders sit communicates balance, rhythm and timing to the horse. Do we pay attention to the fact that every movement in the saddle is a body language with meaning for the horse? Are we even aware of what our movements are saying to the horse while we are in the saddle? Can we sit in such a way that we do not interfere with the natural abilities of the horse? Do our body habits impact our horses way of going? 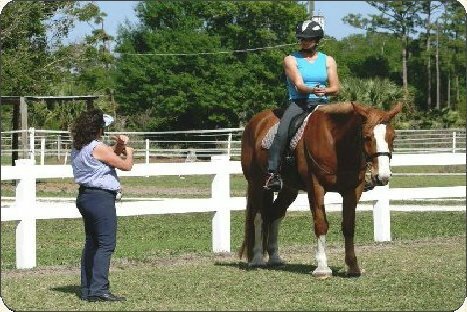 Level Four Advanced Centered Riding® Clinician and position specialist Judy Cross Strehlke teaches the second part of Body movement communication with the horse while in the saddle. The first time we see a horse move the communication continues as we learn a whole new Language of Balance of the Horse in Part Three. The first movement the horse makes either in hand or under saddle allows us the continue communication by helping the horse develop their own natural strength. Do our horses have the balance and muscle strength to carry themselves for whatever task we are asking them to perform? Do we take the time to help the horses develop their own balance and strength? Do we listen to the balance language of each horse? Classical Movement Trainer Hanna Engstrom teaches how to develop the strength and balance of horses to carry themselves in natural balance while working in hand and under saddle. about with a bucket and a wheelbarrow. where my horses graze, and watch them. Journey schedule: Our goal is to meet 6 times a year for four days each time for three years. 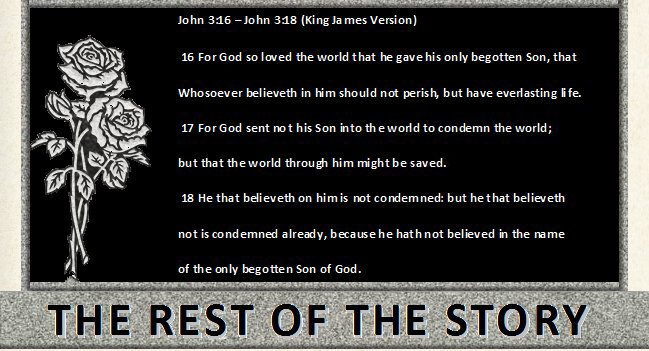 This can be shortened depending on the wishes of the participants. 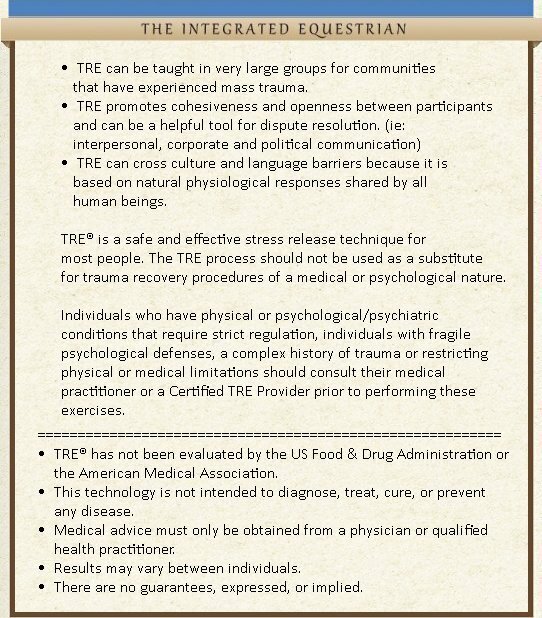 During the entire Journey we all meet several times with all three clinicians. Part one: with Piet Nibbelink starts this educational course. After participants have completed Part One. 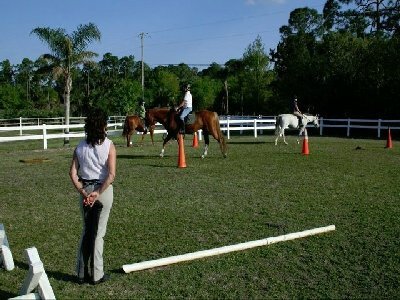 This part is based on the Centered Riding® techniques. 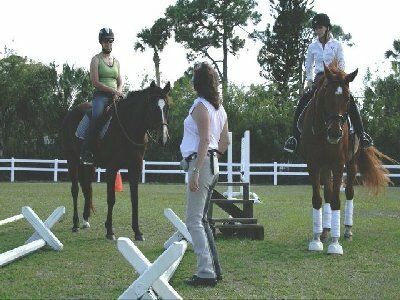 If students are ready and have successfully completed the requirement of Centered Riding® they can be awarded Instructor Level I. 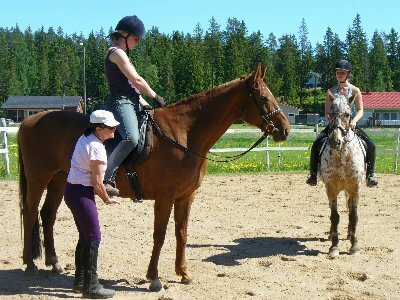 Members then start Part Three with Hanna Engstrom in the Classical training of the Horse and rider. This session end with again the last meeting of all three instructors. After the course, participants can continue their education in three yearly updates one with each instructor. These are also four days long and include continuing the work learned in the Journey. intention leads to optimal learning"
What is Brain Gym® ? Brain Gym is a series of simple body movements used to integrate all areas of the brain to enhance learning and build self-esteem. The exercises can be done in just a few minutes and can be used by anyone. They are easy to do, and the benefits are immediate and obvious. For detailed descriptions of the movements used in this manual, see Brain Gym Teacher's Edition, by Dennison and Dennison, 1989. These movements facilitate the integration of the brain for whole-brain learning and aid in completing neurological development. 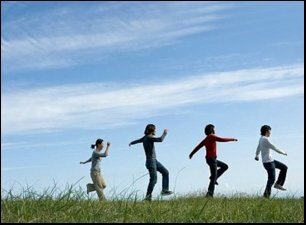 Simply stated, Brain Gym is movement that stimulates or calms brain function. We can tell the children that Brain Gym is moving their bodies to wake up their brains. Brain Gym is a program of physical movements that enhance learning and performance in ALL areas. Brain Gym includes 26 easy and enjoyable targeted activities that integrate body and mind to bring about rapid and often dramatic improvements in concentration, memory, reading, writing, organizing, listening, physical coordination, and more. Brain Gym develops the brain's neural pathways the way nature does - through movement. Brain Gym began in the 1970's with the work of educators Dr. Paul Dennison and Gail E. Dennison. Originally, the Dennison's were seeking more effective ways to help children and adults who had been identified as "learning disabled". They drew from a large body of research by developmental specialists who had been experimenting with using physical movement to enhance learning ability. The Dennison's produced an innovative new approach to learning: the Brain Gym® activities, and the field known as Education Kinesioiogy (Edu-K), "learning through movement." Today Brain Gym® supports people of all abilities in making wide-ranging changes in their lives. Brain Gym® is used in more than 80 countries and is taught in thousands of public and private schools worldwide and in corporate, performing arts, and athletic training programs. Brain Gym/Educational Kinesiology (Edu-K) is a practical and dynamic approach to learning. Brain Gym uses simple movement to integrate the left and right brain functions for a task. When action originates from whole brain balance, the body's natural learning abilities are revitalized and performance becomes easy and effortless. 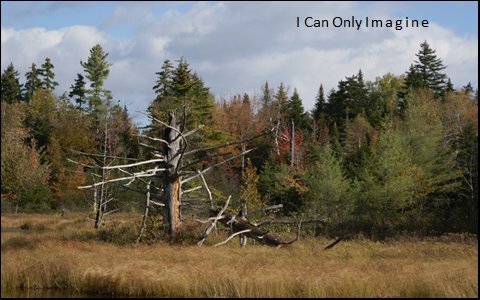 An integrated system increases self confidence and maximizes mental, physical, and creative abilities. to You. You`ve taught me right from wrong and how to work upon this land. You`ve fed my family, warmed our home, and made our lives so grand.